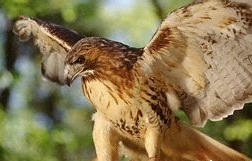 Since about 1990, Lakeview Farms has had two resident Red-Tailed Hawks that nest in our woods. While the hawk's favorite food are the mice that inhabit the rolling grassy slopes and small grain cover crops, I have on several occasions seen the hawks ( 4 foot wing span ) swoop down and pick up a small rabbit or large snake on the fly. The hawks usually perch in the high trees near the the troll bridge or cruise the sky above the farm on days where thermals ( upward movement of warmer air which allow effortless gliding in the sky ) are especially good. Their keen distance vision can detect even the slightest motion on the ground so any snake that strays into well mowed grassy fields or a strawberry patch usually becomes easy pickings for the hawk. Red-tailed hawks are normally very reclusive and generally avoid people but they have adapted to our suburban farm environment and regard me, the tractor, and our customers as sort of unpaid "jungle beaters" that drive their prey out into the open. It is not uncommon to see them perched high on a electric pole above a crowd of U-Pick raspberry customers patiently waiting for their next meal to be "scared up".